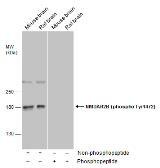 Specificity/Sensitivity: Specific for the ~180k NMDAR NR2B-subunit protein phosphorylated at Tyr1472 in Western blots. 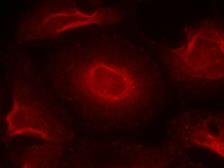 The antibody also labels proteins of ~65k and ~115k. Immunolabeling is completely blocked by blocked by either gamma-Ptase or by the phosphopeptide used as the antigen but not by the corresponding dephosphopeptide. 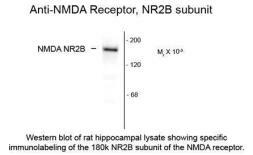 Specificity/Sensitivity: This antibody detects NMDAR2B phosphorylated at serine 1303.